Regenerative Medicine is being transformed by ongoing research and clinical findings at a rapid pace. Such breakthroughs in adult stem cell therapy technology, protocols and patient results as have been achieved with Okyanos Cell Therapy are paving the way for this emerging field to become a more accessible standard of care for patients worldwide. As the Medical Advisory Chairman at Okyanos, Eric Duckers, MD, PhD, FESC, FACC has worked to develop the protocols used in more than 200 cases since the facility’s opening in late 2014. Having served as investigator on the ADVANCE and PRECISE cardiac clinical trials and others, Dr. Duckers brings advanced research insights to point of care. The Regenera Global conference, “Regenerative Medicine 2.0: Redefining the Practice,” will offer a global perspective and overview of the most current regenerative medicine knowledge in both research and clinical applications and will feature prominent physicians including the Mayo Clinic’s Thomas A. Gonwa, MD; as well as the Director of Regenerative Medicine Research at Texas Heart Institute, Doris Taylor, PhD. Dr. Duckers will speak on the use of adipose- (fat) derived stem and regenerative stem cells (ADRCs) for heart failure and acute myocardial infarction in his conference address, highlighting some of the mechanisms of patients’ own reparative cells to address insufficient blood flow, repair or replace damaged heart muscle and reduce scar tissue which forms on the heart after a heart attack. To set trends for future research. To learn more about Regenera Global or to register for this conference, please visit http://www.regeneraglobal.com. Patients can learn more about cell therapy at Okyanos by calling 1-855-659-2667 or by visiting http://www.okyanos.com. Based in Freeport, Grand Bahama, Okyanos brings a new standard of care and a better quality of life to patients with chronic, degenerative conditions. 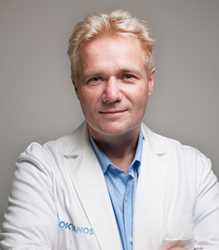 Okyanos Cell Therapy utilizes a unique blend of stem and regenerative cells derived from patients’ own adipose (fat) tissue which helps improve blood flow, modulate destructive immune response and prevent further cell death. Okyanos is fully licensed under the Bahamas Stem Cell Therapy and Research Act and adheres to U.S. surgical center standards. The literary name Okyanos, the Greek god of the river Okeanos, symbolizes restoration of blood flow. Based in Puerto Rico, Regenera Global, Inc. is a bio-technology firm focused on developing and commercializing innovative therapies, providing consulting services and educational events to physicians and healthcare practitioners to expand their knowledge of regenerative medicine clinical applications which may include, but is not limited to, stem cell and gene therapy, tissue engineering, and select medical devices. Regenera Global is working to bridge the gap of access to regenerative medicine between the progress made through research and what is available clinically to physicians and patients.